The Philadelphia Eagles will conclude training camp Tuesday morning, or at least the portion of training camp that the media is allowed to watch. They still have one more practice to go, but since it'll be a lame "10-10-10 practice," and thus not likely to be opinion-changing in any way, let's take a look at five players who impressed this camp, and five who did not. 1) QB Carson Wentz: Wentz's quick recovery from ACL and LCL tears was the early story of camp, which gave way to the Eagles' decision to hold him back once he got going. Still, even though Wentz was held out of 11-on-11 drills, it is clear to see that he is delivering the football with velocity and accuracy, and there's little reason to believe that he won't be very, very good again this season, assuming he stays healthy. 2) TE Dallas Goedert: You all saw it on in the first preseason game. Goedert gets open a lot and catches the football (even if he did have a drop in that game). He is going to be an immediate contributor in the Eagles' offense. 3) OL Matt Pryor: Pryor was dominant in 1-on-1 drills all summer. He is a massive offensive lineman with guard/tackle versatility who has become a lock to make the team, and has shown enough to provide optimism that he can become a starter at some point in the future. 4) Kamu Grugier-Hill: It appears that Nate Gerry has the inside track to become the starting WILL linebacker this season. In my view, Grugier-Hill has shown more upside, as he flies all over the field and makes plays with his impressive athleticism. 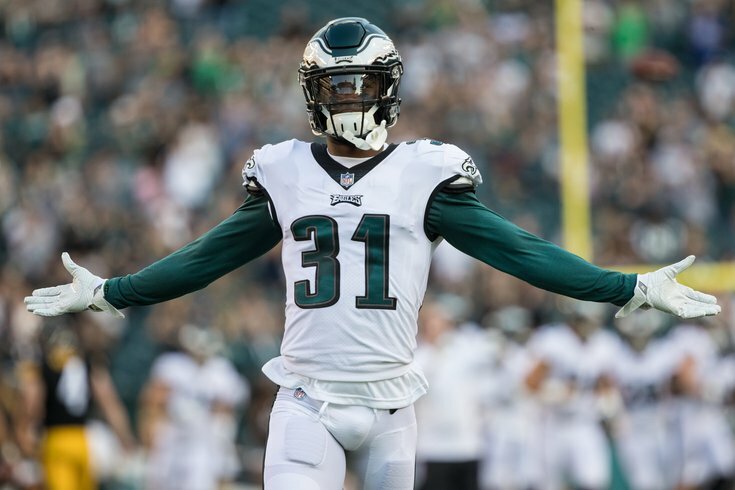 5) Jalen Mills and Ronald Darby: Mills has always been a good practice player, but he turned it up this training camp, and has looked like a good starting corner in the NFL. Meanwhile, after coming into the Eagles' system late last season, Darby looks comfortable within the defense, and has shown his natural gifts on a daily basis. If these two guys play during the regular season the way they played in camp, the Eagles' defense is going to be really good. OK, so that was six players, not five. 1) RBs Donnel Pumphrey, Matt Jones, and Wendell Smallwood: In a running back competition that was wide open for any one of these three players to grab a hold of, not one stood out above the crowd. • Before Pumphrey got injured, he was blaming a dropped pass in an open practice on the lights at Lincoln Financial Field to another reporter. • Smallwood has been "OK," but his camp last year was far superior, and he still got buried on the depth chart anyway. He also didn't help himself with a bad fumble in the Eagles' first preseason game. • Jones missed an opportunity to show his big boy style of running in the first preseason game, which he missed due to an injury. The lack of shine from these three backs has opened the door wide for undrafted rookie Josh Adams to grab a roster spot. 2) WR Mack Hollins: Hollins had a golden opportunity to show that he has made a jump in Year 2 as a professional receiver, especially working with the first team offense all summer in Alshon Jeffery's absence. However, he has simply not made many plays. Hollins is a core special teamer and solid No. 4 receiver. Maybe he can become more than that at some point, but he did not show that he deserves to be a starting receiver during this camp. 3) Isaac Seumalo: Jeff Stoutland called Seumalo the most improved offensive lineman on the team, which is fine and good, but he has averaged roughly a bad snap a day. There's no way the Eagles could possibly trust Seumalo to play center right now if Jason Kelce went down. 4) DT Haloti Ngata: He did nothing. Like, I can't recall one single time in which Ngata stood out in a positive way. Not once in 14 practices. It's certainly possible that the 34-year old big man was saving himself for the regular season, which is understandable, but you'd think the guy would wake up on occasion and make a play just to show his new teammates that he can play. That never happened. 5) LB Corey Nelson: The Eagles signed Nelson on the first day of free agency, hoping that he would be a suitable replacement at the WILL spot for Mychal Kendricks. Instead, Nelson has clearly been outplayed by Nate Gerry and Kamu Grugier-Hill. I believe there's a serious debate on whether or not Nelson will even be on the final 53-man roster.